This cutters are uniquely designed to cut the exact amount of tobacco from the head of any cigar. Just insert the cigar's head into the large opening, hold it in the calibrated chamber and clip off the exact amount every time. The cut-off tobacco remains in the cutter's chamber until you open the cutter to properly discard it. The cutter's body is solidly made with lightweight resin. The self-sharpening double blades are made from surgical grade stainless steel and will clip cigars of all ring gauges, even 60 ring gauge cigars. Each is packed in an elegant gift box and is Lifetime Guaranteed. A perfect cut is guaranteed every time or you get a free replacement. This unique cutter is made with surgical grade Stainless Steel blades that cut with exact precision. 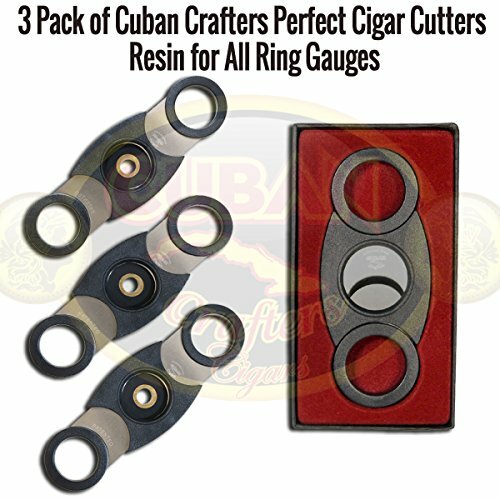 Cuban Crafters PERFECT cutters are designed to fit precisely in the smokers hand during the precision clipping process. When not in use it fits in any pocket. Cutting your cigars correctly means you will have a better tasting smoke, so do it right. The object of the cut is to create an ample and smooth opening for smoking. This allows you to draw evenly, which in turn creates an even burn. This cutter will always make that exact cut without any guess work. They are made to function exactly as expected every time and are fully backed by an exclusive lifetime guarantee. Durable black plastic and Stainless Steel Blades. Can be used for cigars with ring gauges of up to 60. Each is packed in an elegant gift box. This patented cigar cutter is an exclusive that was designed by our engineers for every cigar smoke. If you have any questions about this product by Cuban Crafters, contact us by completing and submitting the form below. If you are looking for a specif part number, please include it with your message.